On Air Elements for MTV Arabia. MTV Arabia have launched two weeks ago, creating a buzz in the Arab world, particularly Dubai, as the new youth oriented and long awaited channel that will compete with existing Music Channels in the Middle East. For more than 8 month, we have been working at Tarek Atrissi Design on supporting with the conceptualizing, design and production of some of their Motion Graphics (as well as a custom Arabic Typefaces / font, see previous Post)- and I will summarize in this post the design process of our work, and some of our comments on the visual identity created for it. 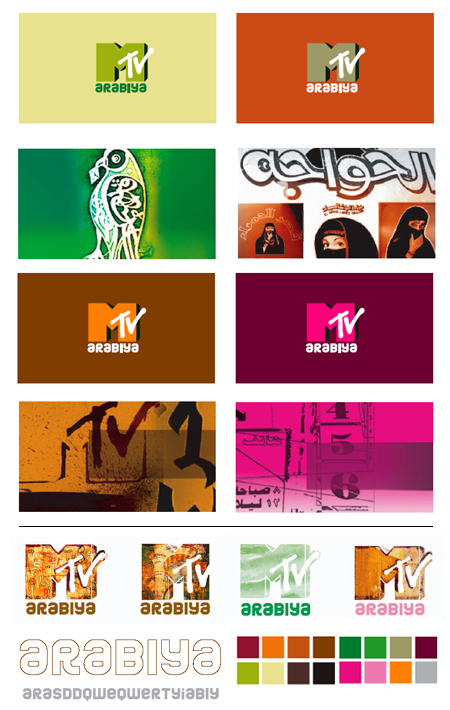 Above: Previews from our own (rejected) proposal routes for MTV Arabia’s identity (initially briefed as “Arabiya” in terms of spelling). Unfortunately, we were not behind the logo and visual identity / branding created for the Channel. We are not a big fan of it as a matter of fact. We were invited earlier in 2007 to put a proposal for the logo and visual identity of the channel, and we proposed an exciting, youthful and rich Arabic solution for a corporate Identity system- but we never won that Pitch; the project was awarded to a Dubai based agency. The logo created for MTV Arabia consisted of the classic MTV logo, filled with Arabic isolated letters that form the word “arabia”. While the concept of the logo has potential, I found its execution to be very poor. The Arabic letters in the logo were from the widely used Bassima Font- a calligraphic digital font that fails in my opinion to create a unique look, and that in itself is a poor handwritten calligraphy imitation. That said, our most criticism for the identity created was that it did not include, beyond the logo and the brand strapline, a clear and elaborate identity manual that explains the usage of the multi-version very colorful logo, and the definition of a unique visual language and graphic elements. And as users of this identity, at a later stage, we found it very difficult as designers to understand the visual brand, or how to expand it while working on several projects for the channel. Screen Graphics from a second route from our proposal for MTV Arabia’s identity- never implemented. Back to our work involvement; Loosing the Pitch did not stop MTV Arabia from commissioning us at Tarek Atrissi Design to create the identity of five Shows of MTV- from logo, look and feel and motion graphics design and production- as well as design a series of Bumpers for the channel. Previews from the identity and motion graphics of the MTV Arabia show Alternative Nation. The project was challenging on many levels. On one hand, the five shows were very different in style and content; On the other hand, we were wondering what the bigger picture and mission of MTV is, and if they will just be importing international shows and content and literally “translate” it, or if it will be more rooted in the Arabic context and emerging out of a unique niche MTV Arabia will create for itself. Lack of elaborate briefs and a vague vision of the entire channel did make things more difficult- and eventually we approached the branding of every show as a separate project, trying to base our process on the information given to us about each specific show, and our understanding of both the Arabic culture and the MTV Europe Culture (three of the shows existed on the MTV Europe Channel). We approached most of the shows not specifically with a visible Arabic style, because we certainly did not want to have an imposed obvious “Arabic” visual language, and kept our consideration and understanding of the geography and culture behind MTV Arabia on a deeper less visible layer, which we think is the right way to reach the young Arab target group audience of the new Dubai based channel. Each show’s look and feel represented the actual music genre or content nature present in the program: “Alternative Nation” visualized its grunge and rock nature; “World Chart Express” visualized the adventurous and travel aspect of the international music showcased in the program; and “Introducing Blocks” used a kitsch style to visualize the “gossipy” aspect of the program. The only show which truly looked Arabic in its opening sequence and identity is “Pure Arabia”, simply because the content of the show was focused on Arabic music, and hence the typographic approach (using Fedra Arabic of the typographic matchmaking project) seemed the most appropriate. 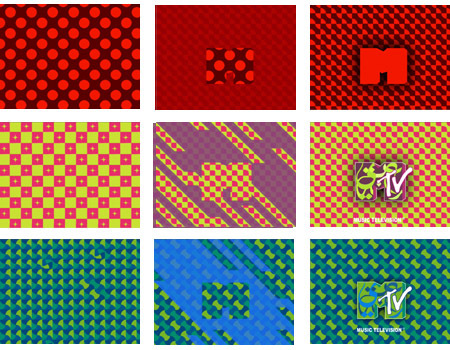 As for the bumpers series, and after many trials and exploration of several approaches, the final outcome was a series of flat and abstract short animations, starting with patterns inspired from an arabesque concept- yet very modern- that builds up the MTV logo. preview from the Bumpers series developed for MTV Arabia. Our full work for the MTV on air Elements and show identity projects can be seen in more details on the following link– where we documented the project as a portfolio piece- and where samples of the set design designed for some of the shows are displayed as well. On the bigger picture, the success of MTV Arabia as a channel is to be judged in the future, seeing if it will be able to be as influential in Arabia both in music and culture as much as it has been in the West.